At Corfield House we offer you a warm welcome. All our bedrooms (one ground floor) have ensuite facilities and are equipped with flatscreen digital TV with Freeview, digital clock, hairdryer and tea/coffee making tray.A DVD player is available if guests wish to play their own DVDs. There are fresh flowers in the rooms, fluffy white towels and very comfortable beds (king sized or twin) fitted with high quality cotton bedlinen. Breakfasts are cooked to order, using the best local produce that we can source. Guests are welcome to use the attractive garden. There is ample off-street parking and a lock-up for cycles. Corfield House is a no-smoking house. The peaceful rural village of Sporle, or more accurately Sporle with Palgrave, is a typical 'long village' of about 1000 people. In Edward 1 time a Priory was established in Sporle which survived until approxiamately 1420. The village church, St Mary's, is notable for its wall murals of St Catherine of Alexandria. We would be pleased to reserve a table for you for dinner. There are other good pubs and restaurants within easy reach. Sporle is close to the attractive market town of Swaffham, with its magnificent church, Saturday market and open-air auction. Corfield House is ideally situated for touring Norfolk. Within easy reach, on the quiet Norfolk roads, are many National Trust properties, Sandringham, the fine coastline, Thetford Forest, the historic towns of King's Lynn and Norwich and the Norfolk Broads. The Peddars Way skirts the village, passing through the ancient village of Castle Acre, with it's remains of a Norman Priory and Castle, before reaching Holme-next-the-Sea and linking with the Norfolk Coastal Path to Cromer. There are numerous possibilities for delightful circular walks throughout the area. Places to visit include the Norfolk Broads, Iceni Village & Museum, Castle Acre Priory, Oxburgh Hall & Garden, Castle Acre Castle, Gooderstone Water Gardens and Brandon Country Park to name just a few. 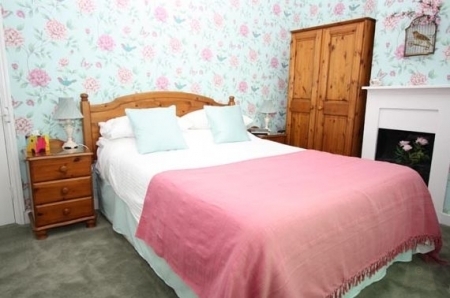 Corfield House has three upstairs rooms in total. 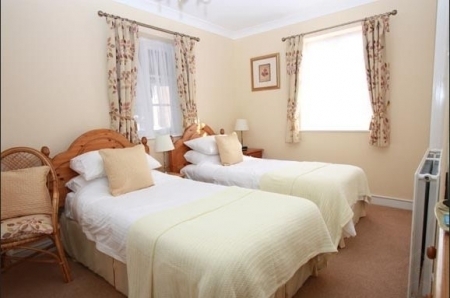 Overlooking the garden and open fields are two comfortable double rooms. 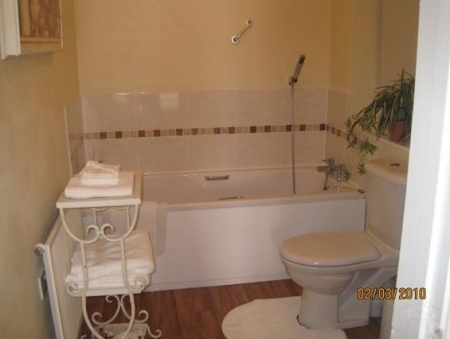 Both have king-size beds, one has an ensuite bathroom and the other has an ensuite shower/WC. The third room is at the rear of the house, looking out over the garden with its apple trees. It has a sloping, beamed ceiling and provides twin beds and an ensuite shower/WC. 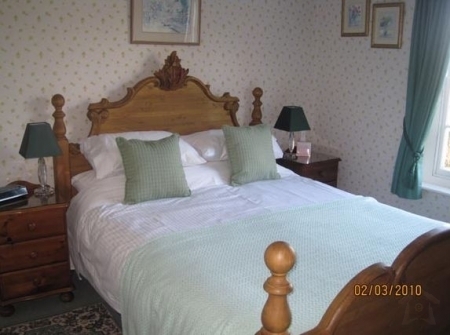 The ground floor bedroom also has twin beds and an ensuite bathroom. The room can be directly accessed from the car park at the rear of the house. This room is particularly suitable for guests with limited mobility since the rear access avoids steps. 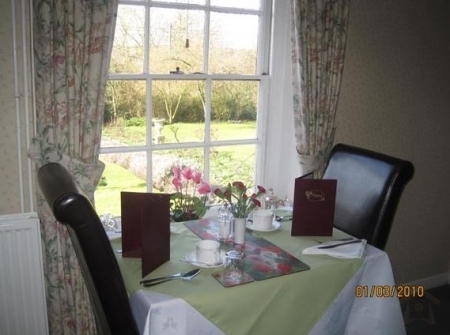 Our comfortable guest sitting room overlooks the front garden and guests are welcome to sit outside to relax, enjoy our peaceful garden and to watch the wonderful sunsets. There is an extensive collection of guidebooks, brochures and maps, together with some suggestions for local walks and touring itineraries. A selection of board games is available for guests to use. We serve a full English or Continental breakfast, freshly cooked to order, using local produce wherever possible. 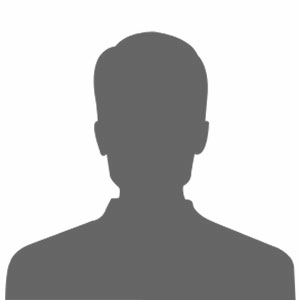 Special diets can be catered for by arrangement. Packed lunches are available on request. 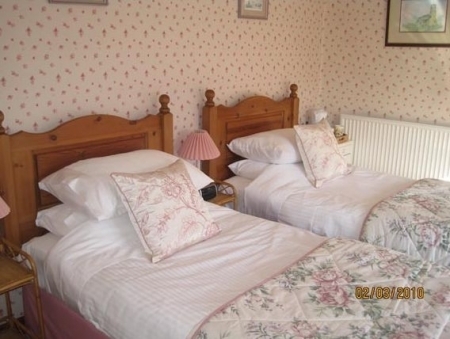 £30 ( EUR 33) per person per night for bed and breakfast for two people sharing a twin or double room. Single occupancy from £40 per night.